Today’s guest post will hopefully make you consider something different for your home. Enjoy! An orangery is a place in your home that can allow for truly amazing decorative opportunities which you and your family will enjoy all year round. However, finding the right tone of décor for your orangery is aided greatly by an understanding of its intended use and style. The following 5 methods of home décor will allow you to get the most creativity out of your orangery’s surroundings. Sometimes we get so caught up in making all our home furnishings match that we forget how much fun it can be to experiment with our décor. Instead of continuing one colour scheme and design throughout your home, an orangery can be the one place where you explore the full extent of your tastes without interrupting the design of the rest of your house. This kind of personal expression also ensures that your home is unique and doesn’t rely upon current trends and styles that are routinely mass produced by major retailers; thereby providing you with truly unique home décor. Despite the new design opportunities that an orangery invites, decorating the structure also makes for an ideal setting in which to continue the themes already expressed in various rooms around the house. After all, we only have so much room in our homes, often without adequate space to fully express our vision. The open space of an orangery can also help us build upon existing colour schemes and designs through the inclusion of ornaments and artwork that further the aesthetic quality of the home. An orangery is usually crafted to appear as a natural continuation of a home rather than as a separately built structure. There are certain kinds of orangery that universally support the appearance of modern homes by complimenting all aspects of their design via a neutral look, such as the visual aspect of aluminium orangeries. 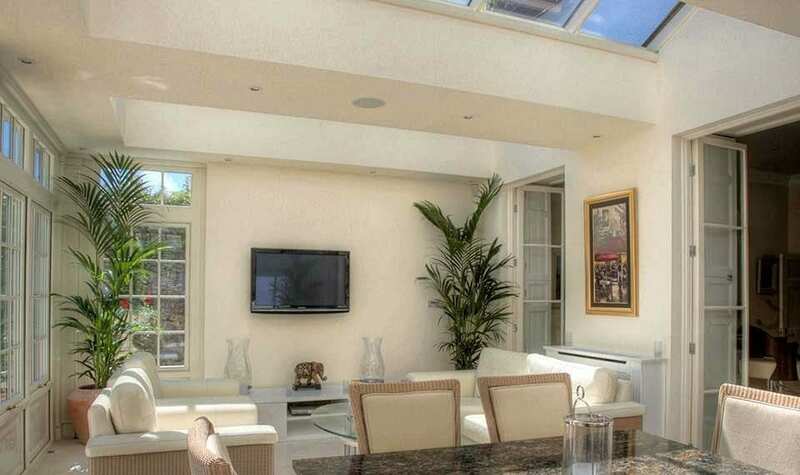 Orangery styles open up all kinds of wonderful interior design ideas. For example, one of the most popular design choices is a classic Victorian style orangery which have such a timeless beautiful quality that you can decorate the interior with furnishings reminiscent of that time period, such as oak furniture and classic 19th century art. An orangery is a wide open space with such potential that you have the option of turning it into a room with unique possibilities of its own. For example, if your orangery will serve as a place for children, the use of bright, colourful surroundings will generate maximum appeal to kids. But on the other hand, if the structure is intended to act as a place of work, such as a home office, a formal appearance boasting an artistic yet conservative look may be a better approach, especially if clients will be visiting your home. If you will be using your orangery as a dining room, the inclusion of soothing, calm imagery and colours is vital for evoking a relaxing atmosphere for your guests to dine in. A neutral colour scheme combining many different shades of blue and green will help set a peaceful tone, which can be complimented by a room layout maintaining the wide space of an orangery’s setting. The newly formed bare walls of your orangery will be perfect for hanging intriguing original artwork that make for great conversation while you dine with your guests. Ever since its introduction into British life during the 1700s the orangery has become synonymous for hosting social occasions and events. This is a tradition that continues to this day; used by organisations such The Fan Museum in London which provides an orangery for its guests to enjoy on relaxing afternoons. Orangeries are built adjacent to home gardens, making them perfect for mirroring the look of the outdoors. Adding decorative colours, patterns and ornaments that match the flowers outside is a process that allows for constant creativity all year round as the many plants come and go with the seasons for a subtly beautiful look. Owning an orangery might be just what you need to fully express the décor of your home. Visit Auburn Hill to see for yourself the wonderful interior and exterior designs that orangeries boast. Wow, in my dreams! What a beautiful space. An orangery is an absolutely gorgeous extension to your home, it creates a fantastic space that you can so much with.